Open Europe: EEA plus: a model for the future of the UK in Europe? For all the noise about Europe in the UK, British sceptics (with some exceptions) aren't necessarily great at thinking outside the box. We have previously looked at the existing models used by countries that have decided against/been refused EU membership (i.e. Norway's EEA membership, Switzerland's Free Trade Agreements, Turkey's customs union with the EU, or simply the WTO) and concluded that they would all have drawbacks for a country and economy as large and diverse as the UK. In particular, the Norwegian model is pretty much a non-starter. However, there is another hypothetical model, which we will set out in a forthcoming briefing, that could be more attractive if it could be secured: let's call it 'EEA plus'. Now, we don't necessarily advocate this particular option and this is only a blogpost, but intellectually and politically, it's far more attractive than anything we've seen so far in terms of a fundamental replacement for the current EU structure. Over the last decade, several figures, including Jacques Delors, former EU Commission President, and Valery Giscard d’Estaing, former French President and author of the EU Constitution, have suggested the UK be given ‘associate membership’ or ‘special status’. Neither concepts have been fully fleshed out, but Giscard d’Estaing suggested that a ‘special status’ could allow the UK to opt-out of future EU policies, which could allow it to continue to vote on policies it took part in but not on those it didn’t. Lord Owen has made a similar argument - which he will expand on in a speech today. From where we sit, there is one absolutely vital element that has to be added if this is going to work for the UK: voting rights. The great weakness of the EEA model at the moment is that a country like Norway, as we have noted repeatedly, is out of the EU but run by the EU. It just wouldn't work for the UK (which is home to 36% of the EU's wholesale finance market, for example). So what 'EEA plus' would involve is single market access but with votes on all laws which are EEA relevant. For EU geeks, it would be a bit like EEA-EU co-decision over single market laws. There are several ways in which this could work. 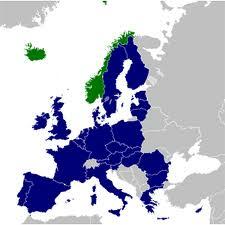 For example, an "EEA council" already exists with members from both the EU and EEA states. This could be expanded to be the effective decision-making body for the EU as a whole in the fields that apply to both constituencies. Alternatively, a majority could be needed in both the EU Council of Ministers and a comparable EEA body for it to become law in both. A range of other issues, such as an arbitrage mechanism and ECJ jurisdiction, would have to be thought through. Also, it would have to be designed so that only genuine single market measures made it into the agreement - not the add-ons such as employment laws (which Norway has to accept) - whilst the UK may wish to stay inside the EU customs union (which Norway and Switzerland are not part of). The UK may also want to be part of other areas, such as crime and police cooperation (perhaps on a bilateral opt-in basis) and there would also need to be consideration about the merits of retaining its veto over EU foreign policy for example. But, crucially, such an arrangement would get around the massive drawbacks inherent in the Norwegian model. Another great advantage of this model is that it could provide an institutional wrapping for all those countries that for one reason or another cannot be full EU members, and certainly not eurozone members: the UK, Norway, Switzerland and maybe even Turkey. It would be a new mode of European membership - and, if the UK can get its act together, very much the "economic growth" tier. If you think this is far-fetched, you might be right, but it's actually not a new idea. In 1989, ahead of the negotiations that would establish the EEA agreement, Delors mooted a “more structured partnership with common decision-making and administrative institutions”, which would have potentially given those countries market access and decision making powers, rather than the limited right of refusal that EEA countries currently have. (ii) or, alternatively, we can look for a new, more structured partnership with common decision-making and administrative institutions to make our activities more effective and to highlight the political dimension of our cooperation in the economic, social, financial and cultural spheres. It would be premature to go into the details of this institutional framework. I have my own ideas, but they need to be discussed by the new Commission and then informally, without obligation, with the countries concerned. It should be noted however that the options would change if EFTA were to strengthen its own structures. In that case the framework for cooperation would rest on the two pillars of our organizations. If it did not, we would simply have a system based on Community rules, which could be extended — in specific areas — to interested EFTA countries and then perhaps, at some date in the future, to other European nations. This option could probably qualify as both "in" and "out". For one, it would be very similar to the Single Market plus deal that Boris Johnson has argued for in the past and, could be defined as staying in the EU, although on a radically different basis. A final sobering thought: the final result of the EEA talks only granted EEA states ‘decision-shaping’ powers through representation on non-legislative committees and consultation with the EU Commission and a right of refusal that is relatively weak becuase it can result in loss of market access – giving an indication that this will be a challenge to achieve. We want no part of any Tarrif Union. We want free trade in the big, growing, real world. The sinking ship of Europe is less and less significant for the future of our nation. It's a superficially attractive idea. But if you want it to be taken seriously you will need to explain how in practice the decision making would work. It isn't enough to focus just on the Council. What about the Commission, the European Parliament and the European Court of Justice? The members of the EU are not going to abandon these institutions just to please the UK. So would there be a British (and Norwegian and Swiss and Turkish?) Commissioner and members of the Parliament and a Judge? If so, how could their roles be limited to the areas of EU activity in which their countries were involved? And do you envisage simply membership of the Single Market or would you want Britain to have a role in, for example, competition policy, external trade policy, energy policy or environmental policy? A Britain which was a full player in all these areas could, if it so wished, claim to be a member of the EU even if it secured opt-outs in other fields. A Britain which simply participated in the single market could not. At least you have grasped that the "Norwegian model" the "Swiss model" etc woild be nul and void with those an other countries (why indeed not Turkey which would never have stomached the EU's constitutional meddling in an Islamic society!! but for which free trade would be attractive)joining the UK AND THE COMMONWEALTH. With such a grouping the bargaining balance would be more than interesting! Rather like those who still cling to the hope that Britain will one day join the euro - it's called "clutching at straws" or "cognitive dissonance", the refusal to face inconvenient facts. We all know what the EU has always intended to become, we all know we do not want to be part of that destination. What part of "totalitarian, anti-democratic, bankrupt, doomed, incompetent, dishonest and devious" does Open Europe still not understand? "I have worked with those people! They are devious, they are corrupt, they are evil" . I could not have put it better myself, and the more time goes by the more I realise how right he was. Would anyone in his right mind want to be involved with them? It is highly unlikely that the EU effectively will split itself in 2 (or 3 if you add the EZ). On the other hand it is essential that the UK has at least a say in but preferably a veto on the stuff that matters for the UK (as OE states). -or a freetrade plus agreement, which would mean changes are only possible if all parties agree. Fully agree that freetrade very likely will have to include customsunion (staying out of that makes being an EU-centre very difficult (as you will end up with piles of extra paperwork when distribute stuff over the EU, which makes any investor thinks twice). Anyway would be a positive if a new structure for the UK could be copied for other countries (Switzerland, Norway, Turkey for instance). The discussion in the UK looks more and more to be hijacked by the 'referendum now' folks. As by far the majority of them whether in parliament has not much to add (at least intellectually) I seriously doubt that that is a positive more a bunch of loose guns. This is not a climate in which you come to optimal or even good solutions. Cameron or better the Conservatives should get grip on their MPs. Eg to start with having them have their say and not starting new controversial stuff from his own side. If nothing changes there is a big problem. It is hard to imagine that this (government by a dysfunctional party) can go on till say end 2017. Commentators etc of the same sort are mainly annoying and a waist of time (at least mine), but not really relavant in the bigger picture of the EU reneg. However Cameron still misses the plot in the way that he should have catched the initiative in this discussion long ago and drive the discussion (determine the agenda) iso being driven by it. Basically the basic idea of a reneg looks pretty good, only the overall strategy is completely lacking (or if there is one failing)and he simply has completely lost the initiative. And the communication towards the other parties (at least the ones at home) is extremely poor). You or your inner circle simply cannot call bigotted Talibani loons. Or after 1/2 a year after the 'great design' of the reneg plan the population still not properly understands that there will remain a link with the EU and reneg is highly complicated, and a referendum now is not Cameron's call as he has no majority. A lot of the misunderstanding in the electorate simply looks to be caused by that. BoJo (probably the only other candidate that can keep the exit crowd quiet at least for a while and has a realistic chance to win an election) has some personal issues playing. "The discussion in the UK looks more and more to be hijacked by the 'referendum now' folks"
That would be the population. Not easy for non-Brits to grasp but there is a marked sea change here and this is something that is going to happen. We are going to go. We might just have to remove all of our political parties first. See the latest poll putting UKIP two points behind the conservatives at 22 percent - the surge is simply staggering. The EU wonks can fiddle with their structures all they want but it won't stop the freight train now that people's minds are made up. Well not as difficult to grasp as apparently for UKips that you need around 50% (and reflected in MPs) of your population to get things happen and not 22%. I suggest you have a look at the word majority in a dictionary. -fall back position in a discussion a one-liner. Glad I am not Cameron and have to pretend to take it all serious. Of course your vote is, the rest is simply not. Anyway enough said on that. On the GS study. Imho it is (in a way) inconsistent. Saying in one part that the UK will not be a Norway or so. In another part that an unstructured exit will hit both economies and hard. Imho that would point clearly into the direction of a deal (on a freetrade zone or something similar). MAD otherwise. One with an RPG the other with a normal bullet, but both are finished at the end. It is clear that that point is not properly communicated (yet?) with the markets and the public abroad. Another communication failure by Cameron and his merry men. Both markets as the EU general public are your friends or could be if you play your cards right. Handellsblatt and several Dutch papers this week/last weekend run some articles in which this also was completely missed. The fact that the otherway around the EUrest would take a big hit was simply completely ignored. GS was already a few steps further, as expected, but missed the fact that it points into the direction of a deal on a freetradezone. More Norway plus iso not even Norway. Anyway communication on that has to be stepped up both towards the markets (if GS donot get it, the rest will certainly not). And to the foreign voters (via the foreign media). Goldman it was btw a first study on the topic clearly they missed some stuff. From another angle (the internal UK discussion) this is the stuff that leads to '3 million jobs' (and probably 4 million in the EU seen the average labourcosts and tradevolumes btw). Probably not in the IKip public's mind, as St. Farage has clearly one-lined that the UK can leave from one day to the next without problems because the EU imports less from the UK, than the other way around and UK exports to the EU (or EZ?) have dropped under 50%. But everybody else might have some worries as they have not seen the light yet, you can not all be blessed. All this bureaucratic mumbo-jumbo is meant to deceive, complicate and suppress. Each cancelled acronym probably means $100 MM or more in savings on the bureaucracy and big government nonsense.